The fourth of Daniel J. Bishop‘s Dispatches on the nature of gaming, structures etc. clocks in at 50 pages, 1 page front cover, 1 page editorial, 1 page ToC, 1 page SRD, leaving us with 46 pages of content. These pages are laid out for digest-size (A5 or 6’’ by 9’’) and thus, you can fit up to 4 of them on a given sheet of paper if your eye-sight’s good enough and you need to conserve ink/toner. We begin this installment with a historic recap of the concept of a mega-dungeon – in both the context of Appendix N, literature and, well, gaming – similarly, we take a look at the development of so-called balance of encounters and it is here that the growth of the series is readily apparent. Instead of antagonistic opinions, we receive a well-reasoned recap of the development of monster/encounter-balance over the course of various editions – and the sentiment expressed, namely that encounters do not need to be level-appropriate, is one that I wholeheartedly subscribe to. While I am an enemy of set-ups that just screw players over, I similarly am a big enemy of designing worlds all around the PCs and ensuring that they will always have an “appropriate” challenge. As the pdf aptly surmises, this takes away from the organic nature of the world and also eliminates player agenda – when all challenges are strictly level-appropriate, player decisions to play risky or more cautious matter less. Similarly, treasure should be worthwhile – not just a +5 sword of killing stuff – the treasure to be found in a massive dungeon should engender greed, paranoia…you get the idea. Treasures are categorized similarly to monsters. The pdf then proceeds to guide you through brainstorming: From the power of names to sketches of critters and how they potentially interact/make sense, the brainstorming general section is fun and directly leads into pattern mapping, which is VERY important. We have an intrinsic idea of what looks “right” and many “makes no sense”-moments in published modules could have been avoided by properly structured planning. Furthermore, the book teaches to envision first how areas interact, rather than their direct proximity – since ultimately, the dungeon’s structure is beholden to the needs of storytelling, this makes sense and yet again makes for an excellent piece of advice. Having done the basic sketches, we use the previously generated list and then note, by respective region, where they’ll fit in: This generates the details and, wholly organically, can generate the whole dynamics of a given dungeon. The shrine the goblins worship is in the vampire lord’s territory? Okay, are they allied? In a master/slave relationship? Is coercion involved? 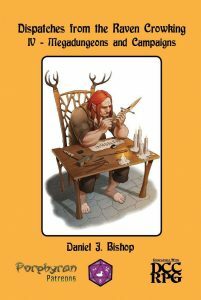 This establishes the general structure of the dungeon, and from here on out, once we have established a general vision, we move to the specific and can marvel at Daniel J. Bishop’s seasoned pen elaborating on the themes and topics previously established, adding the evocative flourishes to the great base-lines – suddenly, Esbastus becomes a gynosphinx; there is a vampire survivor of an age long past. A woman of Jade. Monster hunter Owlgrin. This dressing-series alone may be worth getting this, even if you’re not per se interesting in the design/writing-advice provided. In case you’re interested: Both otyughs and their evolved brethren receive full and proper DCC-stats herein…and yes, the final chapter is where the book transitions from excellent advice for any game to the material directly applying to the DCC-rules: The considerations, colored by the aesthetics, do mention some excellent resources beyond the confines of the rules-set, both regarding literature and gaming material. In short – this section ends the dispatches on the same high note it began. Editing and formatting are excellent, I noticed no hiccups. Layout adheres to Purple Duck games’ nice 1-column standard and is pretty printer-friendly. The pdf sports quite a few nice full-color pieces. While fans of PDG may be familiar with some, I don’t have reasons to complain here. The pdf does provide a nice map and sketch to illustrate the process. The pdf comes fully bookmarked for your convenience. Daniel J. Bishop’s Dispatches series has been excellent from the get-go: The advice provided goes into more detail and depth than that provided by many comparable supplements. While the author and I sometimes deviate greatly regarding our opinions, I have yet to encounter one of these books that hasn’t provided some sort of trick, idea or knowledge – these are great advice-books, even for veterans. Much to my pleasant surprise, this installment provides a well-balanced look at the subject matters sans needing to rely on the subjectivity clause, which is still here, though – just in case. This supplement provides some very smart pieces of advice regarding the daunting task of structuring big pieces of in-game landscape – whether mega-dungeons, wildernesses or settlements. It is my contention that the advice herein can help you design all of them and more. This is, in short, an inspired little advice booklet, well worth the extremely fair asking price. My final verdict will clock in at 5 stars + seal of approval. If you struggle with “big design” in games or think you’d like to learn some tricks of the trade – this delivers. You can get this cool advice-book for GMs and writers here on OBS! You can directly support Purple Duck games making cool DCC-content here on patreon!